Last night’s clash between the Houston Outlaws and the Seoul Dynasty in the Overwatch League was dire for both teams. One was trying to keep a streak alive, another recovering from two straight losses, and both still posturing for a playoff berth. Seoul has been in a rut after falling from undefeated to 5-2, galaxy-braining themselves out of running team captain Ryujehong against the London Spitfire and falling 0-4. Houston, on the other hand, was trying to keep a hot five-win streak alive despite a key player watching the match from home. Both needed this game to secure their playoff chances. Ultimately Seoul came out on top, but the win was not easy. Houston forced the match to game 5 and the third point, the last possible round to play, despite star player Jiri “LiNkzr” Masalin still out on sick leave. The story of the night was Fleta, Fleta, Fleta. Byung-Sun “Fleta” Kim put up highlight after highlight as Widowmaker, proving difficult for the Outlaws to deal with. He snapped to targets, landed headshots, and even picked heroes out of the air with deadly precision. With LiNkzr out, it was time for Jake Lyon to step up for the Outlaws. And across five maps, he put up a fair performance. It was, as always, his Junkrat that truly impressed. In the right situation, Jake was able to pick apart Seoul with a booming barrage of explosives, splitting them up and forcing misplays. But when push came to shove on the final point in the final map, it was Seoul who gave a little bit more. The Dynasty hero this time was not Fleta or even Ryujehong, who had a stellar return to the team after his mysterious absence against the Spitfire. It was Joon-Hyeok “Zunba” Kim, on a flex Zarya pick, that absolutely had the Outlaws’ number. 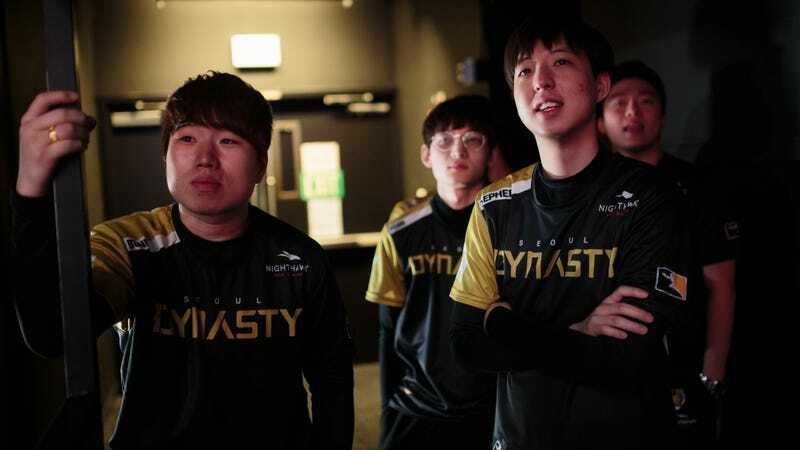 Seoul Dynasty manage to keep their playoff hopes secure, while the Outlaws are now in the rat race among other five-win teams like the Los Angeles Valiant and Philadelphia Fusion. Tonight’s matches will help establish a clearer playoff picture moving into the final week of stage 1, and you can check those out starting at 2 p.m. ET on the Overwatch League Twitch channel.